We’ve been printing documents and pictures for ages and lately 3D printers have been helping us make all kinds of 3D objects like toys and custom parts for equipment. Now the latest use for 3D printers is to create custom human bones. Washington State University researchers have modified a 3-D printer that usually creates metal parts to do just that. They are creating a bone-like material that acts as a framework for new bone cells. The hope is that after a few years, doctors and dentists will be able to print custom bone tissue on demand. So far it looks like this bone-like material has no ill effects and it also eventually dissolves, but only after it has provided the framework for new bone cells. They also encourage the growth of new bone that fuses with existing tissue. This opens up a world of possibilities that doctors did not have before and could create nearly perfect replacement parts. The process is also fast. Researchers report that networks of new bone cells grew within the structures after only a week when they placed them with immature bone cells. It has a long way to go, but this seems very promising for decreasing patient recovery time. 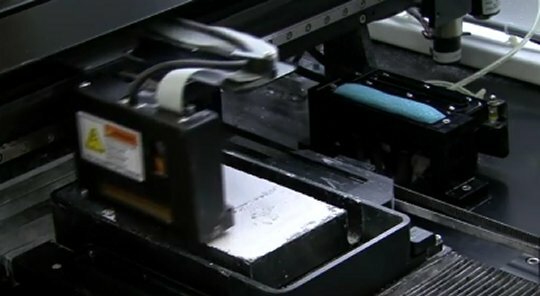 1 Comment on "3-D Printer Makes Custom Human Bones"
This system dispenses and deposits living cells and other materials on a surface to create living tissue. The cells are deposited on a platen in programmed graphic patterns, in one to thousands of cycles.